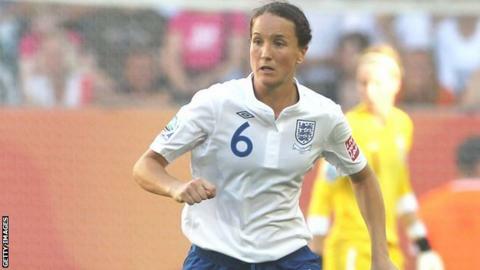 England captain Casey Stoney is set to sign a new deal with Lincoln Ladies. The centre-half, who captained the Great Britain side that reached the quarter-finals of the London Olympics, is out of contract following the end of the Women's Super League season. The 30-year-old told BBC Lincolnshire she has received offers from England and abroad, but does not want to move. "I'm agreeing terms. I have not signed anything yet but as far as I'm aware my future is with the club," Stoney said. "You have to consider what is best for my future and I have sat down and had deep talks with our chairman and chief executive, and I am sure there will be an announcement soon." Stoney joined Lincoln from Chelsea Ladies in 2011 prior to the first WSL season. Earlier this month, fellow England internationals Sophie Bradley and Jess Clarke signed one-year contracts with the Lady Imps, with an option for a further year.